My husband loves pork chops. Personally I’m not really a fan. I often find them dry, tough and not particularly pleasant. 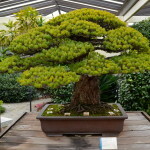 But they are high on my husband’s favorites list, and if he had his way we’d eat pork chops much more frequently. When he does eat them it’s usually when I’m too busy to cook and he offers to throw something on the BBQ. Inevitably he’ll run to the market and come home with the dreaded pork chops. Or he’ll make a trip to Costco and without exception, arrive home with a 24 pack of them. He puts them in the freezer for a rainy day when he can cook them up against my will. So, in light of these unfortunate truths in the Becker household I decided I needed to find a way to prepare pork chops that even pork chop haters like me would enjoy. It needed to be a preparation that would give the dreaded things a little moisture, tenderness and some added flavor, giving them a real kick in the pants. 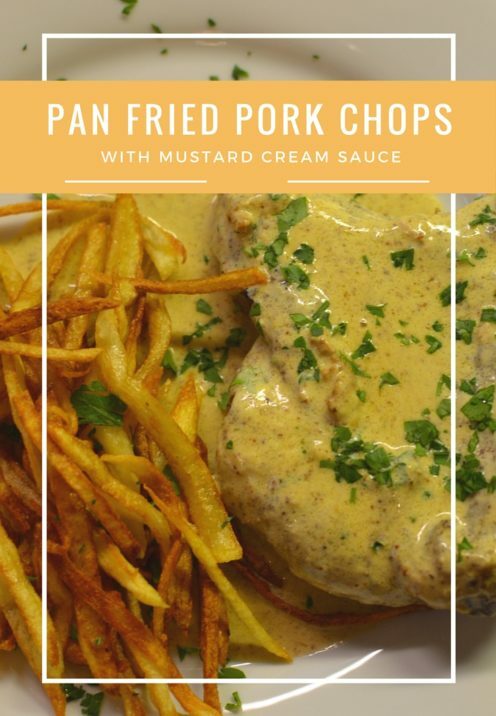 So, I came up with this mighty fine recipe for Pan Fried Pork Chops with Mustard Cream Sauce. Add 1/2 cup Kosher salt and 1 teaspoon whole black peppercorns to 2 quarts of cold water in a large bowl or container. Stir to dissolve the salt. 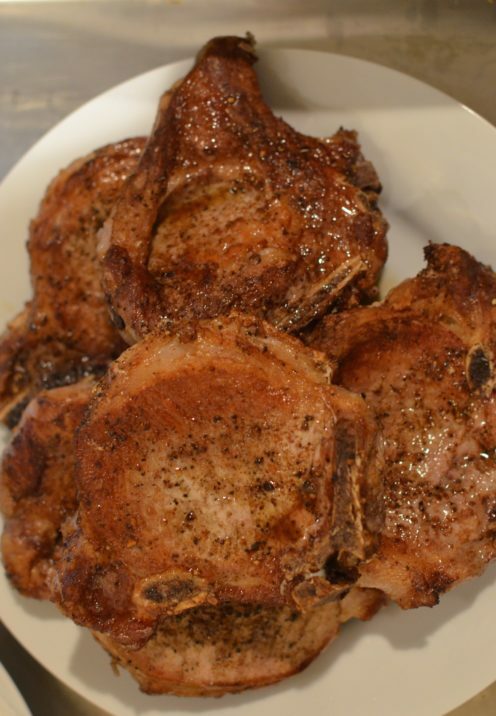 Submerge the pork chops completely in the brine, cover the container and place it in the refrigerator overnight. Sometimes I actually brine my pork chops for up to three days. 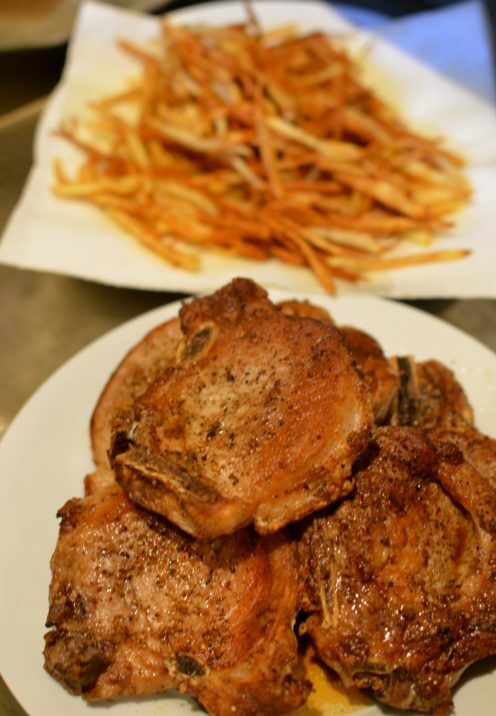 When you are ready to cook the pork chops remove them from the brine and pat them completely dry with paper towels. Drying the meat well will help it to brown in record time. Also, brining will not result in salty pork chops, just juicy, tender and flavorful ones. Note: some recipes for pork brine call for lots of added herbs & spices. Because we are making a mustard cream sauce for this recipe, please just make your brine as described here, otherwise the flavors will fight each other. Make sure you have blotted the pork chops dry with paper towels. Then season both sides with Kosher salt and coarse ground pepper to taste. Heat the olive oil and butter in a large frying pan on medium-high heat. Add the pork chops to the hot pan and cook, turning several times until golden brown on both sides and your instant-read thermometer registers 140°F to 145°F in the thickest part of the meat. Transfer the meat to a plate and let them rest while you prepare the mustard sauce. If you have a warming drawer use it at this point to keep the meat warm while it rests. If not, tent it loosely with a sheet of foil. I like to serve this dish with fried shoestring potatoes, so I prepare those at the same time as well. I’ll have to show you how to make them another day. Returning to the frying pan in which you prepared the pork chops, drain off all but about 2 tablespoons of fat. Reheat the pan to medium heat and add the sherry. Mix with a flat wooden cooking utensil to deglaze all of the crunchy, browned goodness from the pan. Add the cream and mustard and whisk to combine. Add Kosher salt and coarse ground pepper to taste. Cook for a couple of minutes until the sauce begins to thicken a bit. By the way, it’s important to note that this recipe calls for a particular type of mustard. Please use Country Dijon Coarse Ground Mustard. 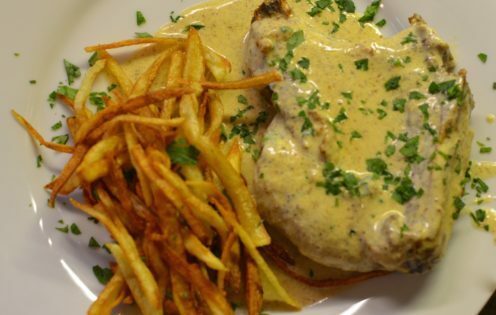 The mustard seeds give it a particular texture and flavor that makes this sauce special. If you can’t find it in your grocery store here’s a handy link to the product on Amazon. 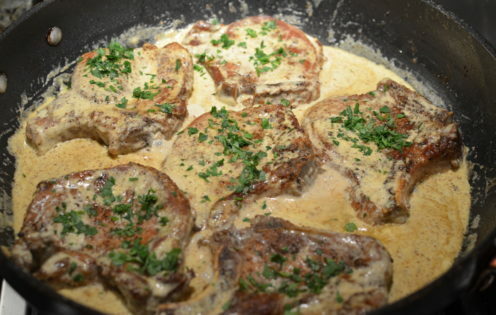 Add the pork chops into the mustard sauce along with the juices from the plate. Spoon the sauce over the pork chops. Sprinkle them with fresh minced parsley and serve. This dinner is a real treat. It’s one of those dinners you make when you want to treat your meat and potatoes loving husband to something special. Add Kosher salt and peppercorns to cold water in a large bowl or container. Submerge the pork chops completely in the brine, cover the container and place it in the refrigerator overnight. Sometimes I actually brine my pork chops for up to three days. When ready to cook the pork chops remove them from the brine and pat completely dry with paper towels. 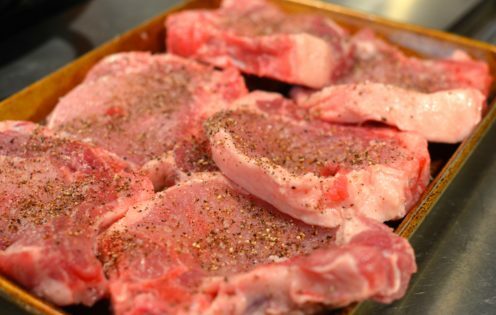 Blot the porks chops dry with paper towels. Season both sides with Kosher salt and coarse ground pepper to taste. Heat olive oil and butter in a large frying pan on medium-high heat. 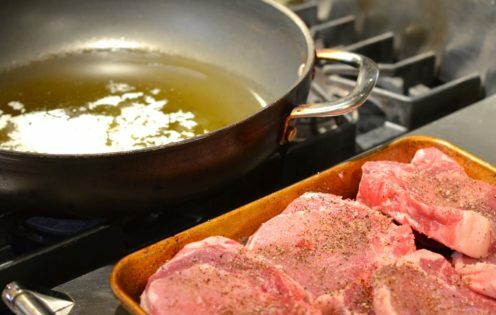 Add pork chops to the hot pan and cook, turning several times until golden brown on both sides and your instant-read thermometer registers 140°F to 145°F in the thickest part of the meat. Transfer meat to a plate and let them rest while you prepare the mustard sauce. If you have a warming drawer use it at this point to keep the meat warm while it rests. If not, tent it loosely with a sheet of foil. Returning to the frying pan in which you prepared the pork chops, drain off all but about 2 tablespoons of fat. Reheat the pan to medium heat and add the sherry. Mix with a flat wooden cooking utensil to deglaze all of the crunchy, browned goodness from the pan. Add the cream and mustard and whisk to combine. Add Kosher salt and coarse ground pepper to taste. Cook for a couple of minutes until the sauce begins to thicken a bit. 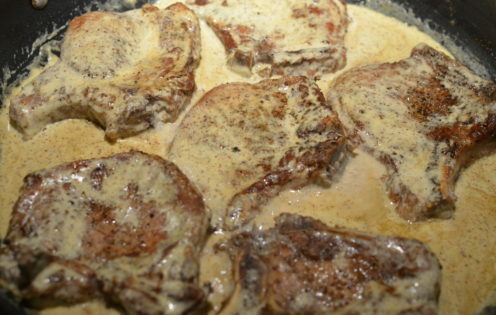 Add the pork chops into the mustard sauce along with the juices from the plate. BRINING NOTES: Brining will not result in salty pork chops, just juicy, tender and flavorful ones. Drying the meat well will help it to brown in record time. Also, some recipes for pork brine call for lots of added herbs & spices. Because we are making a mustard cream sauce for this recipe, please just make your brine as described here, otherwise the flavors will fight each other. 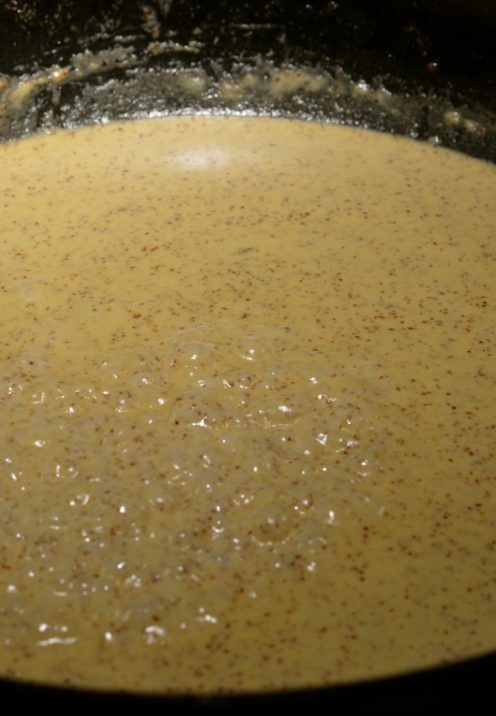 THE MUSTARD: Don't go using just any old mustard for this recipe. It is important that you use the Country Dijon Coarse Ground Mustard. 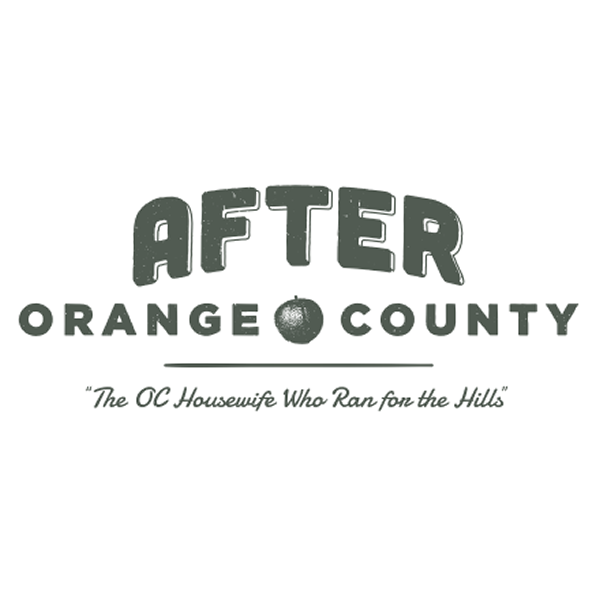 If you don't know where to find it here's a handy link.